Take advantage of exclusive discount pricing and special discounts for new and used autos with Members Heritage Car Buying Service, powered by TRUECar. Participants see an average guaranteed savings of $3,078 off MSRP** when buying a new car from a TRUECar Certified Dealer. Applying for a Members Heritage loan is easy and convenient. apply online via Online Banking Apply in person, by mail, via phone/fax or online. 100% financing available on new and pre-owned vehicles. Extended warranty and GAP insurance options. Indirect Lending Program allows you to finance with us at the dealership. Choose to make payments by automatic deductions from your account. Click here for information regarding the Extended Warranty Program. Auto Insurance coverage plans available with Members Insurance Services. Other types of vehicle financing available with variable rate Secured Loan: ATV’s, RV’s, motor homes, boats, farm equipment and motorcycles. New to Members Heritage? Apply Here! Complete financing with the credit union right at the local dealership! 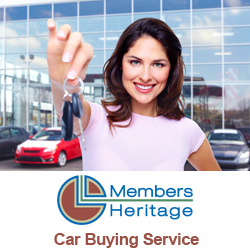 Shop for your dream car at participating Indirect Lending dealerships and finance with Members Heritage right on the lot. There’s no need to make a special trip to the credit union to apply for a loan. Just tell the salesperson you are a Members Heritage member, and you want financing through your credit union. Dealers can even open new credit union member accounts, so tell your family members that they may be eligible for our financing. Click here for a list of participating dealerships. Need Some Extra Cash? You can now skip a loan payment* and have more cash when you want it! One Skip-A-Payment is permitted per loan per calendar year. There is a $20 fee for each loan payment that is skipped. To take advantage of this offer, complete this online application. *In order to participate, all loans must be current and accounts must be in good standing. Loans that have had an extension or payment modification, within the last year may not qualify. This offers does not apply to mortgages, home equity loans/2nd mortgages or credit cards. Interest will continue to accrue on your loan during the month you skip your payment. Future claims for credit disability, credit life insurance and GAP claims may be affected by participating in the program. Skipped payment will be added to the end of the loan contract. Some restrictions apply. **Between 7/1/13 and 9/30/13, the average estimated savings off MSRP presented by TRUECar Certified Dealers to users of TRUECar powered websites, based on users who configured virtual vehicles and subsequently purchased a new vehicle of the same make and model listed on the certificate from Certified Dealers, was $3,078, including applicable vehicle specific manufacturer incentives. Your actual savings may vary based on multiple factors including the vehicle and select, region, dealer, and applicable vehicle specific manufacturer incentives which are subject to change. The Manufacturer’s Suggested Retail Price (“MSRP”) is determined by the manufacturer, and may not reflect the price at which vehicles are generally sold in the dealer’s trade area as not all vehicles are sold at MSRP. Each dealer sets its own pricing. Your actual purchase price is negotiated between you and the dealer TrueCar does not sell or lease motor vehicles.